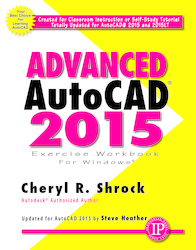 Advanced AutoCAD 2015 Exercise Workbook by Cheryl Shrock and Steve Heather is the right book for users if they liked the author’s Beginning AutoCAD 2015 Exercise Workbook, or they’re looking for a clear, no nonsense, easy-to-follow text, or they want to learn more about AutoCAD such as Xref, Attributes, and 3D solids. Totally updated for AutoCAD 2015 and 2015 LT, it offers several new and improved features. All exercises print easily on a standard 8 ½” x 11” printer. For use with the PC version of AutoCAD 2015 only.